Look at the lovely things I got from Katie via the CAC Color Swap! 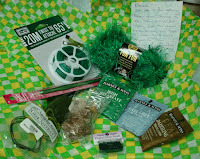 She sent me fun fur yarn, a crochet needle, beads-lots-o-beads!, tea, chocolate! 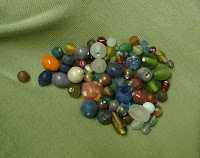 and twisty ties... oh how much fun I will have stringing up the beads and making a nice furry scarf with the yarn. The crochet hook might actually inspire me to learn to crochet! Becca, I'm so glad you like it. It was really fun to go on a green hunt. I know those twisties are kinda goofy...but, they were the right color, and somehow it seemed like they might inspire some fun, funky *something*.